Beautiful front door lock set. Has a mid century modern vibe and comes in an array of finishes. Needless to say I am happy and would purchase again! 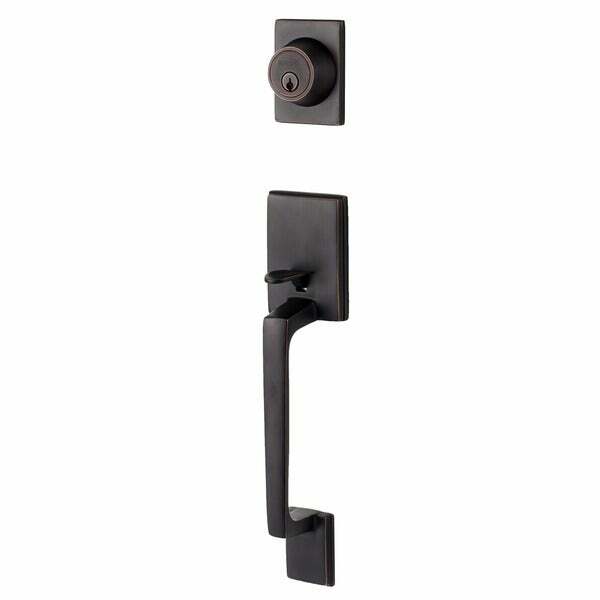 Update your house with this elegant front entrance handleset. This set is made of brass, stainless steel and zinc with an elegant vintage bronze finish, combining great durability with an old-fashioned, urban style. Inclusive of knobs, screws and latches, the whole handleset package provides you with everything necessary for full installation, and it also allows you to select a mushroom knob or lever to better suit your taste. Dimensions: Width is 2.75 inches, projection is 2.25 inches, height of deadbolt is 3.5 inches, height of handle is 12 inches, and distance from latch to lower screw is 9.25 inches. We bought this for our craftsman styler door and we love it! It was easy to install and looks great! We shopped around a good bit and could not find one for a better price. Good quality for the price. Looks better than the picture. We purchased these entry handles for our new construction home. They arrived quickly after purchase and are the perfect accent for our craftsman doors. I used this on a wood door on an older house renovation- it was perfect. The oil rubbed bronze finish is great, and goes with both modern and historical finishes. Perfect addition to our 1877 home. The door handles was easy to install and all pieces were present. It took about thirty minutes and the final result was a very elegant presentation. love the lock set ,Good quality. took A little extra time to install but very happy with it. I just installed it on my new rear porch doors. Looks good, but time will tell if it will hold up to the weather. "Does this set come with keys?" Yes, if you order the entry handleset (507) it will come with 2 keys, If you order the dummy handleset (500) it does not come with keys as it non-functioning. "What is the warranty on lock mechanism and finish? Thanks!" Hello ju1ia, this includes a limited lifetime warranty. Thanks for shopping with us! "Do I need to specify whether I need right handed or left handed hardware?" Hello alexfigment, that option is not available. Thanks for shopping with us! "Could you get an egg shaped interior handle with this handset?" Hello dnichs, we do not currently have this with an egg shaped interior handle. Thanks for shopping with us! "I'm still trying to determine the backset of this handle set. My door is 1 3/4 inch thick so that's fine, but it's 2 3/8 inch backset, will this work? Is it adjustable? Thank you." Thank you for contacting us, housestuffshopper. We send both 2 3/8 inches and 2 ¾ inches Backsets for all orders. So this handleset will work on your door. Please let us know if you have any further questions. "What is the Backset size? is it 2 3/8" to 2 3/4"?" Hello daa135, This will fit a door that is 1 3/8- 1 3/4 inch thick. Have a great day! "What are the dimensions of the squares for the handle (the upper and lower square)"
Thank you for your question sfiester. The dimensions are: Square for the Deadbolt - 2.40 inches w X 3.15 inches h. Square for lower portion - 2.71 inches w X 3.77 inches h. Have a great day.